Portable, stable & lightweight- reinforced Leg System allows for over 1,000 lb. Capacity! Heavy duty, long lasting hard case material. 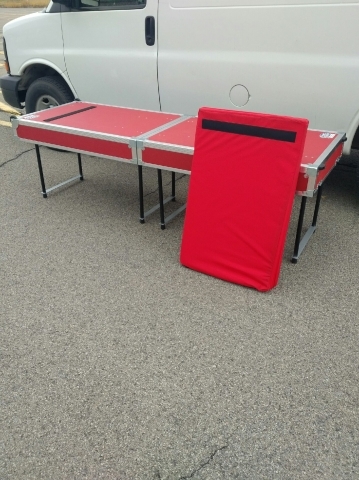 Treatment table can be used for medical and therapy fields including chiropractic, massage, physical therapy, athletic training and sports medicine. Heavy Duty, Lightweight and Portable. 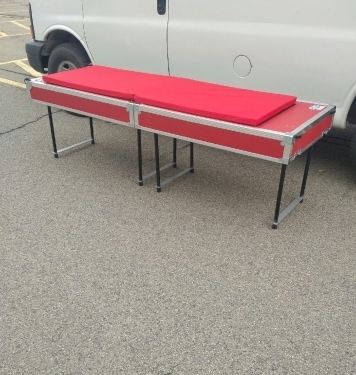 Heavy duty fold-out legs with over a 1,000 lb capacity! Pull-out attachable water resistant cushion. Heavy duty metal pull handle. Recessed wheels for easy maneuverability. Aluminum extrusion protective case edging. 8 heavy duty protective corner case caps. Excess of 100 piece rivet construction. Standard black exterior with grey cushion.